It’s a very, very tired Erica on the blog today. Hence this post being posted a little bit late, I’m sorry about that but better late than never, right? 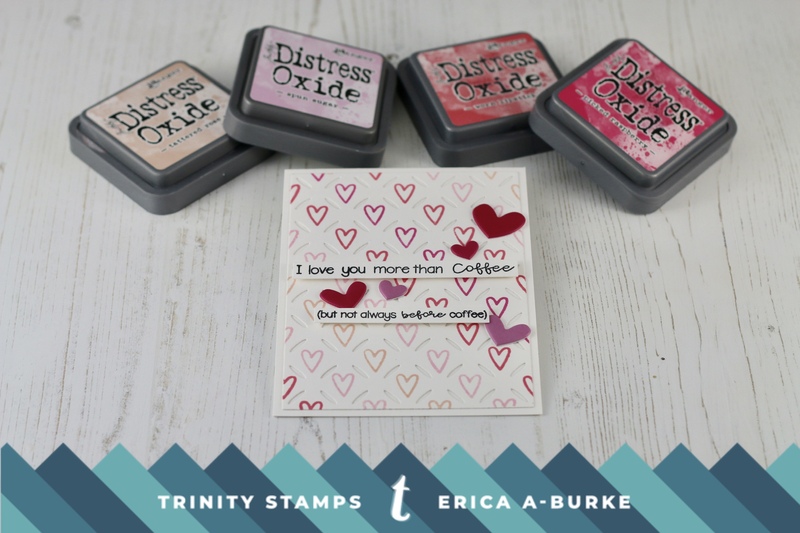 As some of you may know, I attended Creativation with Trinity Stamps this past weekend and W-O-W is all I can say! What an experience…! It was so much fun to meet almost the whole DT team face to face for the first time, not to mention lots of crafty friends! Seeing lots of products coming to stores this coming year was super cool and meeting the people behind all the brilliant ideas. Doing make and takes left right and centre was fabulous as well! Seeing demos of new products was amazing! So many exclamation marks, lol. Right, now I’m going to get to the card before I get over-excited and get heart palpitations all over again. 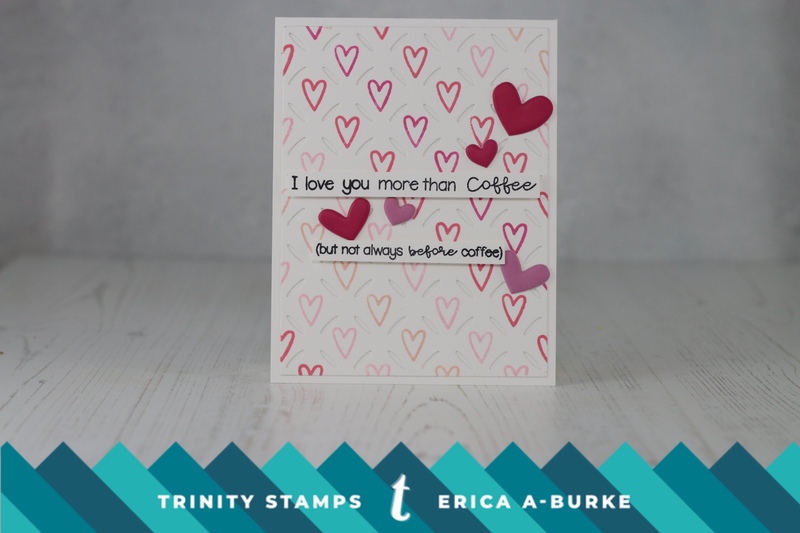 I’ve used two coffee themed stamp sets for this card but with a bit of a twist. Apart from the word ‘coffee’ it’s not my usual caffeinated style. These two sets, Coffee With Character and Caffeinated Sentiments , I use all the time! However, I wanted to show a different take with them. To start with, I ran a white card panel through my BigShot with a diamond-ish shape cover plate. This panel I adhered to a white card base. Then, using Distress Oxide inks in various shades of pink, I’ve stamped a heart pattern in the boxes between the cutouts on the panel. Each diagonal row is the same colour. 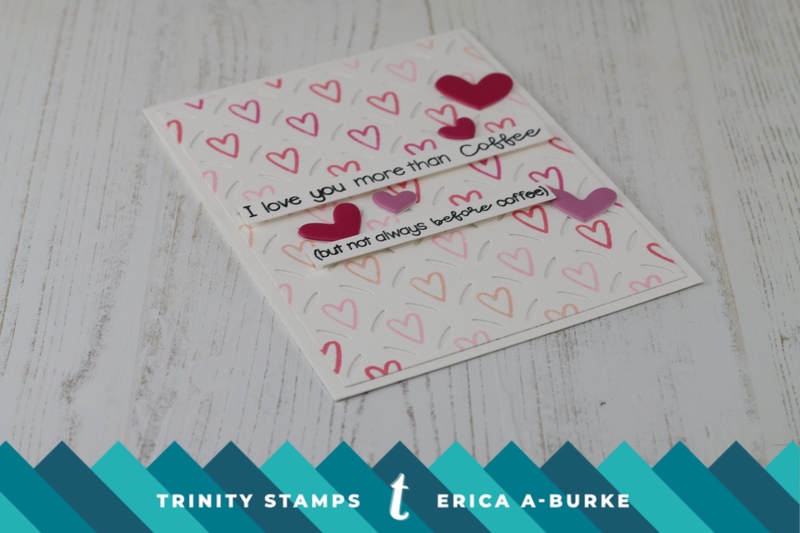 On thin strips of card stock I stamped the sentiment ‘I love you more than coffee (but not always before coffee)’ in black ink. These strips I added to the card using foam tape. Love that stuff! To finish the card off I added some heart shaped puffy heart stickers I have been hoarding for ages. I’m really going to make an effort to work through my hoarding stash this year (she says with confidence and gusto!) We will have to wait and see how that goes but I will try. Well, with that, the card was done. Simple, but isn’t the effect fun? I adore how this came out and I do love to stretch my stamps as it makes me feel like I get more bang for my buck. Which we all like, right? I’ll be back next week with another project, but I might very well sleep until then. Creativation is so much fun but man, it’s tiring to be that excited for three days straight! PS check my Instagram for some pictures from the show!